Adam Ludwig Wirsing was a publisher, engraver and art dealer in Nuremberg specializing in natural history. He was an important engraver of natural history in the 18th Century, engraving plates for some of the most lavish German natural history works such as Trew’s “Hortus Nitidissimus”, Schaeffer’s “Fungorum…”, as well as many others. Wirsing published many important works on Ornithology, and was also the author of probably the finest work on marble. These striking hand colored engravings of birds are from a very rare work by Adam Ludwig Wirsing entitled “Recueil des Principaux Oiseaux et Nids dOiseaux de Allemagne” (Anthology of the Principal Birds and Nests of Germany), published in Nuremburg in 1777. No work with this French title can be found in any standard bibliography, making it extremely rare indeed. Wirsing created these fine prints after those by Barbara Dietzsch. 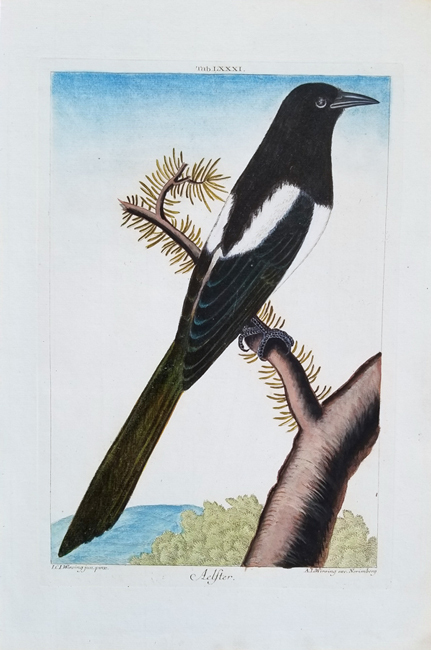 Due to the outstanding water color like coloring in this work, these plates have been recognized as the most beautiful German bird illustrations in the 18th century. Prints from this publication are extremely rare and feature original hand coloring.